I love all the emails I get around Halloween asking me for "healthy" candy recipes. I wish there was such a thing, but sadly, there isn't. I usually just give in and allow my kids to enjoy a few chocolatey or sugary Halloween treats. HOWEVER, in the past, when I've put out a bunch of bowls filled with nuts, popcorn and chocolate chips for trick or treaters and given them holiday themed bags to let them make their own trail mix, they love it! Sure there's always one or two kids who try to fill their bags with 99% chocolate chips and maybe one nut, but there are also plenty of little ones who stuff their bags with a healthy portion of the good stuff and they absolutely love it. 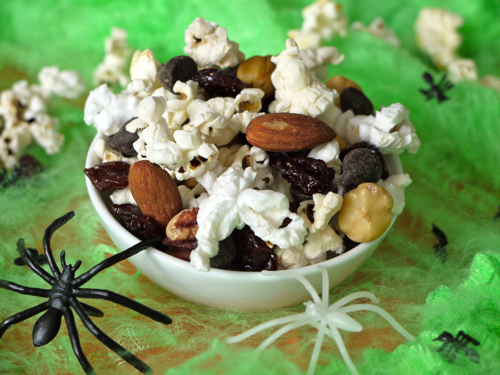 Whether you're looking for a healthy-ish treat on Halloween or just a fun holiday snack idea for the younger set, this Popcorn Trail Mix fits the bill. And until someone invents healthy candy, you can't do much better! 2. Place mixture into individual treat bags. Curious how you pop your popcorn? On the stove (with what kind of oil) or old school air popper? Sometimes I make it in the pot (the way my mom made it for me as a kid) and sometimes I make it in a special popcorn bowl I got at Target that makes it without oil or butter. Great alternative to trail mix! For a school treat day next month, I might toss in a few pieces of candy corn, seasonal colored M&amp;Ms, and leaf-shaped pretzels. Thanks for the ideas Catherine! Hi. I was wondering if you could tell me the appropriate serving size for one person. I know it said 5 1/2 cups but how many does that serve? Just wondering when you started giving your kids popcorn. My son will be 2 next month and I have not tried yet. Thanks! Tracy, I started giving the kids popcorn around 26 months. They can eat a whole bowl of it on our Friday night movie nights. Also try sprinkling some Parmesan cheese over it while still hot. They love that! Thanks for your concepts. One thing we've nocietd is always that banks and financial institutions really know the spending routines of consumers while also understand that plenty of people max outside their credit cards around the holidays. They smartly take advantage of that fact and begin flooding your current inbox and snail-mail box with hundreds of no-interest APR credit card offers shortly after the holiday season closes. Knowing that should you be like 98% of all American open public, you'll soar at the opportunity to consolidate financial debt and switch balances to 0 interest rates credit cards. How long does it keep for? Want to make ahead and put in glass jars as gifts but not sure the popcorn will get too soft after a couple of days? Hmmm the popcorn does get soft/stale pretty quickly. I'm not sure how it would hold up in a jar.